Dwayne Hickles was an imposing figure on the football field but a gentle giant off of the gridiron. Hickles was a standout football player for the Cowley College football team during the 1971 and 1972 seasons and was the president of the Black Student Establishment at the school. 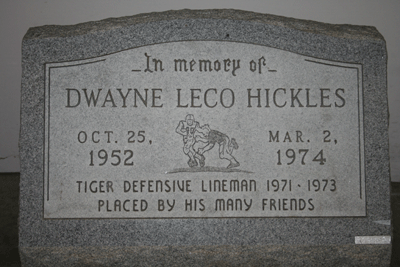 As a freshman defensive tackle, Hickles helped the Cowley football team to a record of 5-3-2. Then, during the 1972 season, Hickles’ strong play led the Tigers to a record of 8-2 overall and a second place finish in the Jayhawk Conference. With Hickles being named a First-Team All-Conference selection, Cowley was ranked 13th in the nation. The eight wins were the second most in school history. While a student at Wichita State University, Hickles tragically passed away in a car accident on March 2, 1974. Prior to Hickles’ death, Roach spent a few months in Arkansas City with his older brother and saw how much he was revered on campus. “He was a real people person, the people at the college loved him,” Roach said. Hickles’ many friends created a monument in his honor that was placed in the courtyard behind the Kerr Technology Building. During renovation to the courtyard in the early 2000’s, the monument was put into storage until another spot on campus could be found to place it. Over the years the monument gathered dust and failed to find a permanent home until one day, maintenance technician Jon Moore stumbled upon it. Moore’s older brother, Steve (deceased), used to be close friends with Hickles, and Jon was stunned to see the monument. Moore, with assistance from Cowley College library assistant Kim Peri, was able to track down Hickles’ sister, LaRonda Brown, who lives in Wichita. Moore shared his story of stumbling upon the monument and arranged to have it given to the family. “I did not want it hidden away for no one to appreciate it,” Moore said. It turns out that LaRonda’s daughter, Kenisha Williams, is a current student at Cowley. Brown, who was only seven years old when Dwayne passed away, was shocked to get the call from Moore about the monument made in honor of her brother. The monument states “placed by his many friends”.